I’m all about making the holidays easier this year, any way that I can. 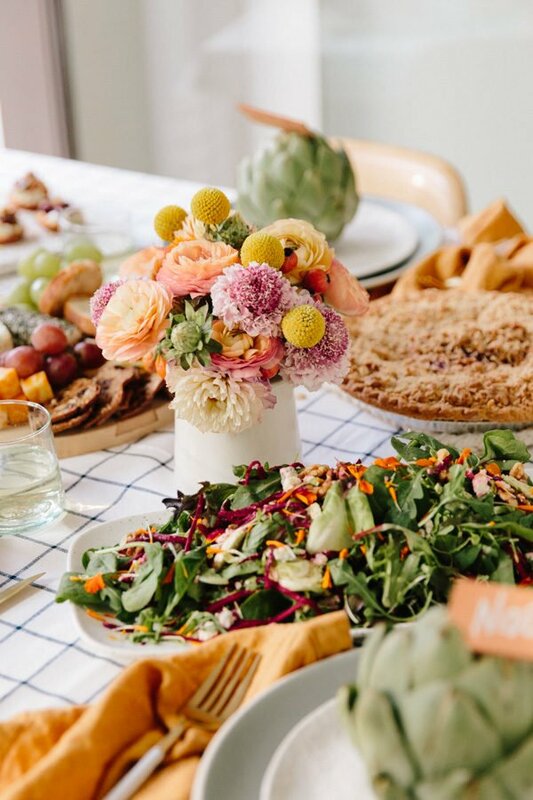 And with Thanksgiving right around the corner, I wanted to share a few super simple DIY ways to upgrade your dinner table for Thanksgiving. 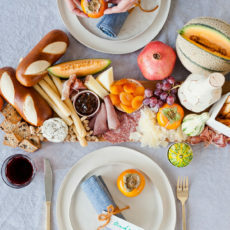 Easy textile ideas, effortless place settings, and a simple centerpiece that guests will love. So, if you’re hosting this year’s big turkey dinner, be sure to click through for my easy tips to make your table look extra special without spending a ton of time. 1. Textiles. 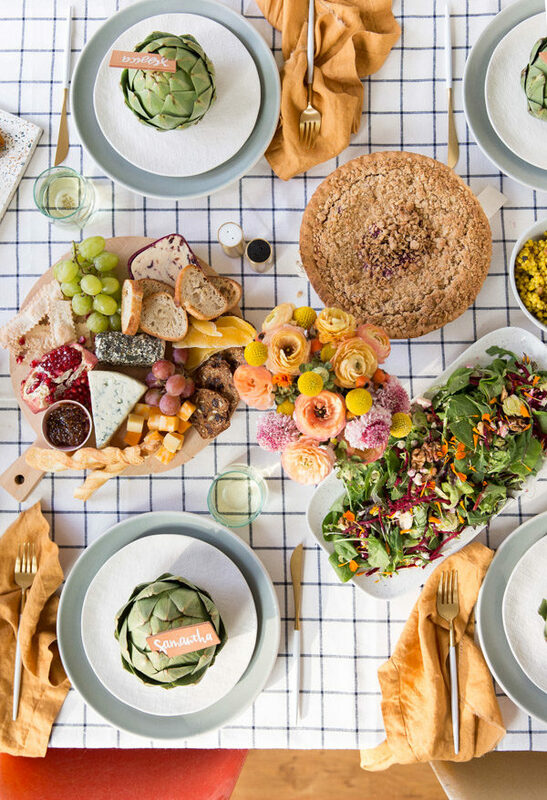 Skip the standard tablecloth and opt for a long piece of fabric instead. 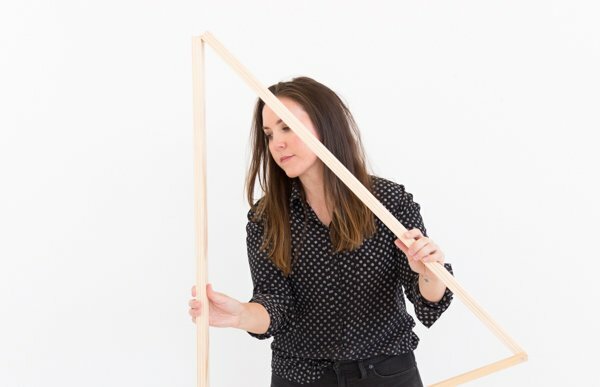 Bonus points for including a simple pattern…stripes, grid lines, etc. I always go with a linen fabric when I’m using it as a tablecloth. 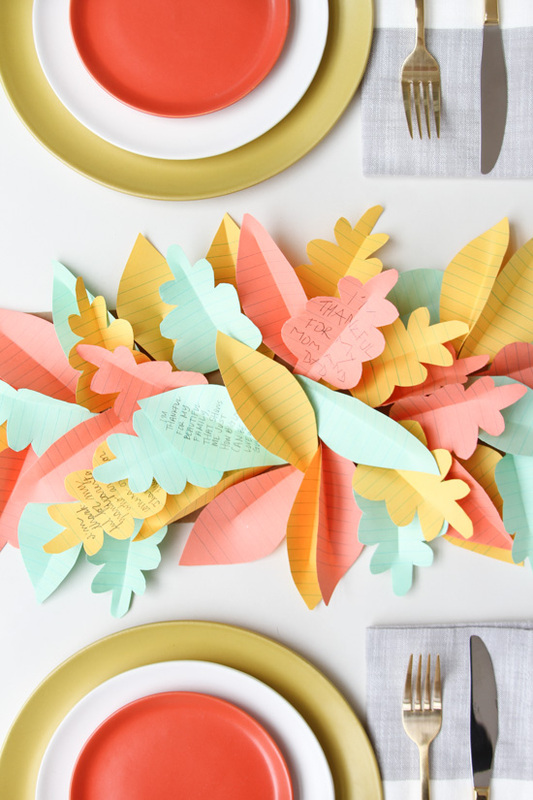 You can also do this with napkins if you have a few extra minutes. Just loosely mark off the standard dimensions for a napkin, cut, and fold up for the dinner table. I like to create a tiny cut with scissors and then rip it the rest of the way down for a more raw / casual edge. 2. A simple centerpiece. Keep it simple with the decor by adding just one small floral arrangement to the center of the table. 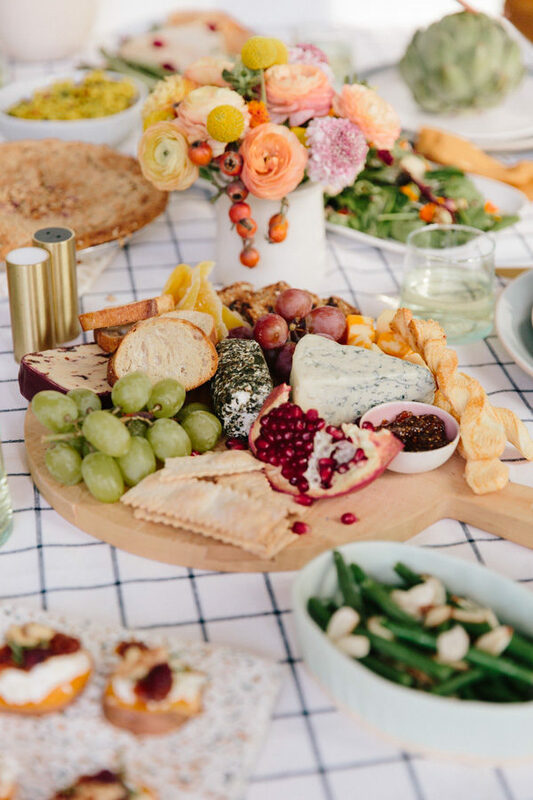 And fill in with pretty appetizers and sides that guest will want to keep grazing on at dinner anyway. Cheeseboards, salads, rolls, etc are good options here. 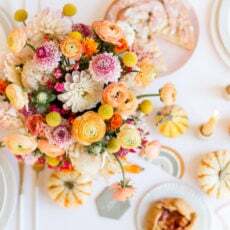 And the floral centerpiece is a smaller version of this DIY Thanksgiving centerpiece I made a few weeks back. 3. Place settings. Use something you already have. 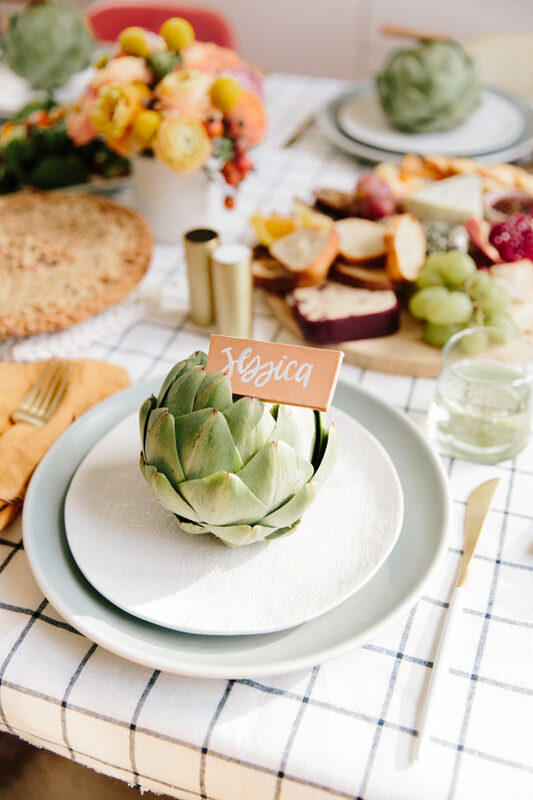 To add a pop of color, I added artichokes to each place setting along with hand lettered name plates on scrap leather. It only take s a few minutes to throw on the table and guests will be impressed, I promise. What are your plans for Thanksgiving? Any plans for decorating your table for the holiday? 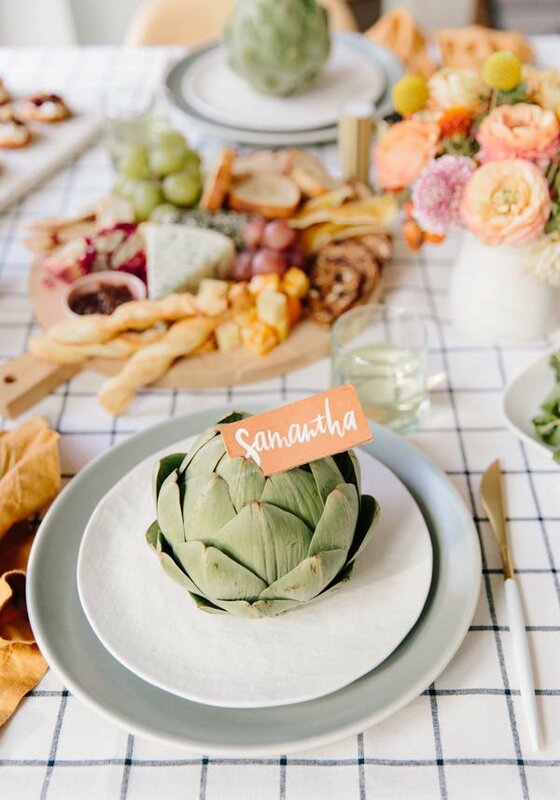 I love the idea of filling in the centerpiece with snacks and appetizers, I think you can also do that wonderfully with fruit!